Now, I have pads for the whole family, except my daughter who is not that interested in having one yet anyway, but I am still keeping one eye open. I don’t need any more pads, and there are definitely other things I could be buying. But something happens once you start buying gear. You don’t want to stop…..
…..and I came across a super sweet deal on an Exped Synmat 7 Pump. I got this pad for $39 on sale at Alabama Outdoors. I had always dreamed about getting one of the Exped mats, but never wanted to drop the money on them (they are typically around $100), but if I were to get one, now was the time, and so I pulled the trigger. This is a pretty sweet pad. It weighs in at 31.5 oz with the stuff sack so it’s a little heavier than the ProLite or the Lite-Core by about 5 ounces. However, this pad is nearly twice the thickness and is a rectangular cut rather than a mummy cut. Also, the R-Value is 4.9, which is considerably higher than the other two pads.Not to mention, this pad too came with a repair kit, and a light weight stuff sack, which totally made it pretty sweet. So, I have only had this pad about 2 months, so after I have it a while longer and can actually take it out on a backpacking trip, I will do a more thorough review on it. 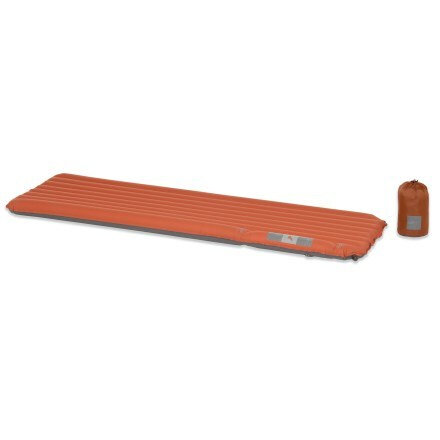 I’d be interested to hear your opinions comparing the Neo to the Exped Synmat 7 now that you have both. I also have both (though have not used either yet) and can’t decide which one to take on a Sept/Oct trip on AT in Maine & NH. I’d like to go light but am concerned about insulation. Irene, I will probably do a comparison between the two sometime after October. I am taking at least a 4-5 day (possibly 9 days) hike with my wife in the Smokies or north of the Smokies on the AT so we will be bringing both of those pads along. Hopefully there will be near 20* temps at night so I should be able to get a good comparison of temperature ratings. I am planning on carrying a ccf pad such as the GG Thinlite or my sons small size Thermarest Z Lite to layer under the NeoAir just in case. (At this point I am not planning on trusting the NeoAir for temps much below 25* alone.) For now, as far as comfort goes, I simply prefer the NeoAir over the Exped. This is not to say that I do not enjoy the Exped though. The NeoAir just feels flatter to me so lying on it feels more natural. Just my opinion.